Five years ago my mother decided to invest in a memorial plan for her and my father. She bought two Life Plan with Money Back worth almost 100,000pesos each and payable for five years. Just last month, my mom announced that she's done paying for the plans and now she's investing with the memorial lot. Why am I sharing this information to you? You know, I am very proud and very thankful of the parents that God blessed me to have. Both my parents are hard-working and goal-oriented. They were very courageous in this memorial investment plan with St. Peter for they don't want us (me and my siblings) to worry about the future. When I heard that they just finished paying for the St. Peter Plan, I was so encouraged to invest with one. I know that it sounds so morbid and you might be wondering why a 21-year old like me will bother investing in a memorial plan. So let me tell you more about St. Peter Plan and the reasons why I believe it is worth the investment. 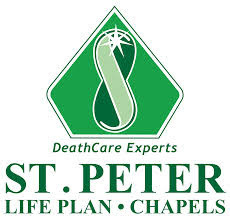 St. Peter is a pre-need deathcare company that focuses in offering traditional memorial plan. You may identify St. Peter with its endorser, Kuya Kim. They have branches nationwide and also affiliate agents if you want to be a member. Since my parents are already finished with the plan they can actually become St. Peter Plan agents and start earning commission, I just have no idea whether they'll do that . St. Peter Traditional Life Plans are known also as memorial service package. They are transferable, assignable and available at easy installment payments. Each St. Peter Life Plan also has value-added insurance coverage. You can click HERE for more information. My parents availed the lowest plan in the St. Peter Life Plans with Money Back called St. Francis. It has the same description as the Traditional Life Plans but this time an amount equivalent to 20% of the Contract Price based on the annual mode of payment of the Planholder will be returned at the end of the 11th or the 16th year (depends on type of plan) from the date of effectivity until the end of the 15th or 20th year (again depends on type of plan). You can click HERE for more information. Memorial Service according to life plan you invested this includes flowers, four days use of chapels and nine days service at home. I shared in a personal blog post before about my fear of death. Slowly, I am becoming better in handling this fear of mine. It is important to acknowledge that death is part of life and we will all have to reach that final point in life. It is so expensive to die and if you fail to have an emergency fund, the family you left behind will be the one to suffer. I believe that it is better to be prepared than regret afterwards. Since I still have lower responsibilities (thanks to my super responsible parents), paying for a memorial plan is highly doable. This, I believe is one of the top reasons why my parents decided to invest in St. Peter Life Plan. The plan holder can transfer the plan to another living person. One life plan can be used by another family member making it an ideal investment for the family. Getting a life plan is an investment you are making for your future. Since you will only be paying it for five years, the investment is super sulit. Just imagine how fast that five years could be. You can also hav the money back guarantee but still have your memorial coverage. If ever I seal the deal with my memorial investment this coming August, I will finish my contract at 26 and wait for 10 years for my money back. That time I will only be 36 years old. I can also decide to sell my life plan to others for a higher price. As I mentioned in the beginning of the post, I am not affiliated or anything to St. Peter. I just feel like sharing my opinion about their Life Plans and maybe encouraged others to prepare also for the future. Remember we can either die young or live too long. Is St. Peter Life Plan worth the investment? My answer is a big, resounding YES. Hope you like this post. If ever I pursue with my goal this August I will surely walk you through step by step process of application and other important details. Are you a St. Peter Life Plan Holder? What do you think of St. Peter Life Plans? 18 comments on "St. Peter Life Plan: Is it Worth the Investment?" I love your blog po!!! Thank you na love mo yung blog ko Ms Izza,hehe. This blog is only a past time, pampatanggal stress sya,diyan ko nalalabas mga hinaing ko sa buhay. Mas love ko itong blog mo :) organize sya plus neat, and ang dami mo pang ads. Madali lang mag edit ng blog Ms.Jing!!! Kapag di ako busy talagang narere search ako kung paano mapapaganda yung blog hehe. Pero naku sobrang gulo pa nga eh... lalo na yung mga ads.. kaya talagang more more aral pa. I hope we can meet!!! Natapos ko na rin bayaran ang St Peter Plan ko last year. Plan 30K ang kinuha ko - 550.00 pa lang per month yun noon. By year 2019 I'll start receiving na may money back. Ok's naman ang St.Peter since I'll definitely use that plan ( morbid din ako, heheheh) but looking forward din ako sa moneyback features nya. Thank you Ms. Grace!!! Your blog is amazing as always! Kelan ka po nag start mag pay? yung St. George ba may money back 550 din kasi hulog ko monthly? How is it an investment? Isn't it just a pre-need product? Ano yung details ng money back guarantee? How much is the average yield of the money back guarantee? Hi Ms. Jill!!! Sorry po for the late reply. St. Peter po kasi is transferable kaya pwede niyo po siya ibenta sa mas malaking halaga (as long as tapos niyo na po siya bayaran). Amount equivalent to 20% of the Contract Price based on annual mode of payment shall be returned to the Planholder each year beginning at the end of 16th year from date of effectivity until the end of the 20th year while you are living. After receiving the Return of Premium, the Memorial Services, in effect, becomes FREE. Hi!!! My parents also does this na. Ako din nga nagbibigay ng prospects kila Mama hehe. Nakakatuwa na may ganito ng program. Sabi nag nila di ba, mas mahal ang mamatay. Comment your email address po para makita ng ibang readers yung contact details niyo po! Just in case anyone need to fill out a My Life Plan form, I found a blank form in this link http://pdf.ac/2JqVW9. This site PDFfiller also has several related forms that you might find useful. Thank you for this info. Very informative and a big help. Keep up the good blog.